Marcel Duchamp was the godfather of virtually all the significant artists of the 20th century. His artistic provocations, including the sculpture "Fountain", gave art a new meaning and created the opportunity for new styles. Duchamp wanted art to serve reason, not "retina." He questioned the very concept of art and the adoration of art. "Henri-Robert-Marcel Duchamp (28 July 1887 – 2 October 1968) was a French-American painter, sculptor, chess player and writer whose work is associated with Cubism, conceptual art. Duchamp is commonly regarded, along with Pablo Picasso and Henri Matisse, as one of the three artists who helped to define the revolutionary developments in the plastic arts in the opening decades of the twentieth century, responsible for significant developments in painting and sculpture. Duchamp has had an immense impact on twentieth-century and twenty first-century art; and he had a seminal influence on the development of conceptual art. By World War I, he had rejected the work of many of his fellow artists (like Henri Matisse) as "retinal" art, intended only to please the eye. Instead, Duchamp wanted to use art to serve the mind. "Readymades" were found objects which Duchamp chose and presented as art. In 1913, Duchamp installed a Bicycle Wheel in his studio. However, the idea of ​​Readymades did not fully develop until 1915. The idea was to question the very notion of Art, and the adoration of art, which Duchamp found "unnecessary". My idea was to choose an object that would not attract me, either by its beauty or by its ugliness. To find a point of indifference in my looking at it, you see. 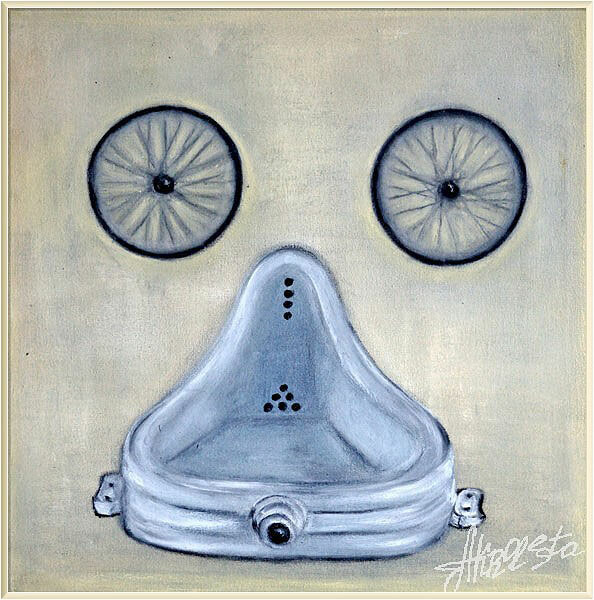 His Fountain, a urinal signed with the pseudonym "R. Mutt", shocked the art world in 1917. Fountain was selected in 2004 as "the most influential artwork of the 20th century" by 500 renowned artists and historians.